When you want the best quality roofing services in New Jersey, choose Airborne Roofing! Our team has been in business for over 45 years and is fully licensed and certified. Our Roofers have Over 45 Years in Business! From commercial roof installation to patching a roof leak on your home, our roofing contractors are prepared for any job! Airborne Roofing is proud to have served the people of South Jersey for over 45 years. Our roofers have decades of experience in all types of roofing services, and are licensed and certified to ensure the quality of our work. We are proud to be a GAF Preferred Installer and a Mule-Hide Preferred Contractor! Whether you’re looking for a roofing company for emergency repair or shopping for a new roof, Airborne Roofing is the team for you. We work efficiently to get your home or business in shape with minimal disruption and always use quality materials and proper installation techniques. Proper roof work is essential to ensure a long-lasting, leak-free system, as poor installation can compromise the integrity of your roof system. Our roofing contractors take great pride in their work and are fully committed to your satisfaction and safety. If you have questions about a product or service, don’t hesitate to contact our friendly staff at (856) 662-1382 ! We are here to help you learn about the different roofing options and help you get the most out of your roof. Our Roofers Provide Free Estimates! If you suspect a problem with your roof or have an urgent problem, call our roofing contractors in Berlin and Cherry Hill, NJ at (856) 662-1382 . Our roofers are happy to provide comprehensive inspections and free estimates on any job. With more than four decades of experience, our crew can quickly and expertly address any problem with your roof. Let us help you get your roof back in shape today with superior residential and commercial roofing services! We look forward to serving you. Your Local Flat Roof Specialists! Built-Up Roofing: Made up of multiple layers for durable protection, built-up roofing is a labor-intensive process requiring professional installation. Our crew has extensive experience in BUR systems and repair. Fibered Aluminium Coatings: If you want a high energy efficiency roof coating, consider fibered aluminum for your building. The reflective surface helps reflect sunlight and control the interior temperature of your building. Flat Roof Repair: Because of the nature and design of flat or low-slope roofs, they need professional repair to ensure proper drainage. Our skilled roofers will make sure your flat roof is leak-free! Modified Bitumen: A modernized, less messy form of built-up tar and asphalt roofing, modified bitumen is durable and lightweight. We offer various installation types to suit your building’s needs! Roof Coatings: There are several types of roof coatings, all providing excellent waterproofing and protection for your roof. Many even make your roof more energy efficient with their highly reflective surfaces. Single-Ply Membranes: Single-ply membranes like TPO and EPDM provide a lightweight and durable solution for your flat roof. Our roofers are happy to help you find the right one! 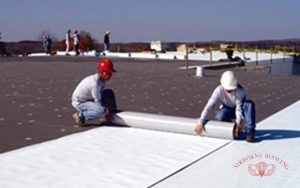 White Rubberized Roof Coatings: One of the major benefits of a white roof is the energy efficient properties, which can reduce your energy bills These systems are also very durable and can add years to the life of your roof. Don’t see what you’re looking for? Call (856) 662-1382 to find out more from our commercial roofing contractors in Berlin and Cherry Hill, NJ today! We Guarantee Quality Repair for Your Home! Fiberglass Shingles: One of the most popular roofing materials in the nation, fiberglass shingles are a stylish and durable choice. They are lightweight and weather- and fire-resistant thanks to their fiberglass mat covered in asphalt. Gutters: Damaged or clogged gutters can lead to serious problems for your home, so if you need repair, call us right away. Our contractors will repair or replace any cracked, rusted, leaking, or damaged gutters to ensure proper drainage. Metal Roofing: Able to withstand wind, rain, fire, hail, and sun, metal roofing can last 50+ years and is an energy efficient choice. Available in more than your typical silver standing seam style, metal roofing is a popular choice. Roof Installation/Re-Roof: If your roof is very old and showing signs of extensive damage, it’s probably time for roof replacement. 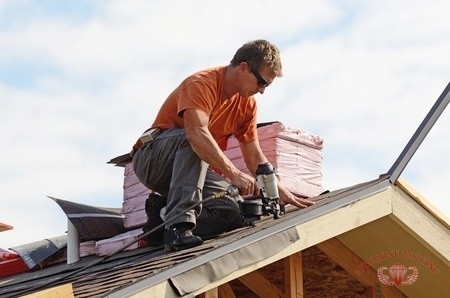 Whether you want shingle or metal roof installation, our team will get the job done quickly. Roof Repair: When you have an urgent roof leak or other damage, call us right away for fast, affordable roof repair! We even offer 24-hour emergency service to handle your most urgent roofing needs. Siding: Keep your home looking beautiful and your energy bills under control with effective siding repair and replacement. While most siding will last many years with proper maintenance, repair or replacement is inevitable. Windows: Your home’s windows play a big role in your home’s efficiency, so if you’re looking to save money, you might benefit from new windows. We also replace broken and damaged windows! If you need any of these residential services, call our roofing contractors in Berlin and Cherry Hill, NJ today at (856) 662-1382 ! We provide free estimates and 24-hour emergency repairs! Updated on September 21, 2018 at 2:38 pm by Airborne Roofing.